Long putts that cause concern about coming up too short often cause the golfer to blow the ball too far past the hole, and a useful approach is to take a practice stroke to a target merely halfway to the hole, then take another practice stroke to a second target halfway between the first target and the hole, and then make the real stroke not shorter than the second practice stroke and with the same size increase in the stroke -- one big step halfway there, then two halfsize steps the rest of the way. The Problem: Monster putts have you three-jacking? When facing a long putt that seems outside the comfort level for distance control, the typical golfer reaction is to dwell on the negative of leaving the putt too short for a two-putt. This anxiety causes the golfer then to "gas" the putt by adding force that he would not ordinarily add, in an effort to make sure the force of the putt is sufficient to overcome the anticipated shortfall. These "gassed" putts are the most common cause of three-putting. The ball almost always blows past the hole too far, and the golfer watches helplessly as the putt just won't stop rolling on the far side of the hole. A Nice Cure: The best cure is better distance control in general, but if that has been attained, this tip would be irrelevant. Most golfers lack good distance control, however, so something of a bandaid approach is necessary. This tip requires the golfer to have and use a consistent tempo for his stroke, and then imagine interim steps to the hole of halfway and then three-fourths of the way along. Making practice strokes to these interim targets, with a consistent tempo, teaches the golfer the proper stroke length to cover the full length of the putt. Zeno's Lag Ladder reduces any long putt to 1/4th the size! Zeno's Paradox: In the Athens of 5th Century BC, Zeno of Elea was a philosopher who believed that all motion and change was illusory, and reality was actually a unified unchanging whole. He offered as proof of this view a series of paradoxes to show the invalidity of the competing view that the world consisted of separate objects in motion. One of these paradoxes was called The Dichotomy. A racer at the starting block, in order to reach the goal of the finish line, would first have to reach the halfway point. But before he could reach the halfway point, he would first have to reach a point halfway to the halfway point, etc. Thus, he would have an INFINITE series of halfway steps to traverse and each step would require at least some small amount of time, which taken all together would necessarily take an INFINITE amount of time, so 1) he could never even start, and 2) he could certainly never reach the finish line. Zeno argued that since motion could not in actuality happen any other way, motion must be an illusion due to our inability to perceive the unified motionless reality of the world. Philosophers have struggled with this paradox ever since. Mathematically, the paradox is addressed and resolved by the infinite series of the Calculus because even an infinite series approaches a well-defined limit. In other words, it is an illusion that an infinite series of steps would require an infinite amount of time to traverse. Even so, Zeno's Paradox helps the golfer get his lags closer. Using a "ladder" of halfway steps to the target gives the golfer a reliable read on the appropriate stroke length for the full distance and greatly reduces or eliminates the concerns about being too short or too long. Zeno's Lag Ladder: 1/2 Step -- The first step of the ladder is to reduce the length of the putt by half. Given the usual size of greens, half of even a very long putt will be very much more in the comfort range for lagging of almost all golfers. So an imaginary practice target halfway to the hole on a long putt will look easy to the golfer, and the practice stroke will reliably result in an appropriate length stroke for good touch. The golfer looks halfway, thinks "I could easily putt a ball to stop halfway," and makes a good practice stroke with the right length of stroke. This halfway stroke is then a good reference length. 1/4 Step -- The second step is to imagine a second target halfway between the first practice target and the hole. This second step is half the size of the first step, so it is a 1/4th size step that gets the putt to the second target 3/4th the way to the hole. As the golfer visualizes this distance, he already has a reference stroke that covers all the way to the halfway step. Intuitively, the golfer knows that the second step by itself is just one-half the first practice stroke further along. This second step, then, singles out for the golfer this one-fourth stroke length addition. 1/4 More Step -- The third and final step of the ladder is to putt the ball with a stroke length that is a) longer than the last practice stroke, and b) that adds no more than the same addition of length added for the last practice stroke. In other words, the real stroke just adds another one-fourth stroke length onto the previous practice stroke. The point of dividing the putt's length this way is to get command of the full length by taking regularly sized bites out of the total length. Targeting a point halfway to the hole, and keeping your tempo, generates a stroke length that is 1/2 of what you need for the whole putt. Going from the halfway point to the 3/4th point simply adds 1/2 of this first stroke, which is an addition of 1/4th of what you need for the whole. The real stroke simply adds the same 1/4th increment again. The way the Step 1 is half, and then Step 2 is half again of Step 1, and then Step 3 is just a repeat of Step 2, cuts the long putt down to size in a way that intuitively reduces concerns about the distance and replaces the concern with focus on targeting distance. The problem reduces to starting from the point 3/4th the way there and covering that final quarter length with an addition just like the last one. This sets an intuitive boundary on how much of a stroke is too little, how much is too large, and what the correct addition ought to feel like. A 4-Step Alternative: Another way to accomplish the same gradations of stroke increases is to make practice strokes to interim targets at one-fourth, one-half, and three-fourths the way, and then make the real putt as a regular increase in the series. Make This Part of Your Game. You may have seen Davis Love III or others standing behind the ball, facing the hole, and making practice strokes in an attempt to gauge the distance visually. I think there are more important fish to fry at this particular location and phase in the routine, and indeed practice strokes for distance usually aren't especially helpful or accurate. (Watch golfers carefully when making practice strokes, and note the stroke length and tempo, then compare the practice stroke to the real stroke -- they seldom match.) But in the one case of a too-long putt accompanied by anxiety, targeting these ladder steps and making practice strokes beside the ball with appropriate length "steps the golfer up" into the comfort zone with accurate stroke length and good tempo control. Try this approach out on some ridiculously long putts on the practice green with three balls. Putt the first ball so it stops halfway. Putt the second ball so it stops three-fourths the way. Then putt the third ball beyond the second ball with the appropriate addition of a 1/4 stroke length to the second practice stroke length. You should find it a lot easier to cut the problem down to 1/4 the original size and roll the ball with good distance control through that last 1/4-size length of the path. Then use just one ball, with two practice strokes as described above. Lag a few putts this way until the problem reduces itself to the final quarter of the length up to the hole. You should find your confidence growing on these long putts, and the occasions when you leave putts real short or blow the ball way by the hole should occur with steadily decreasing frequency. Let Zeno help you Zero in! 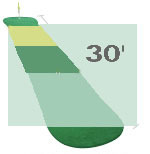 For more tips and information on putting, including a free 10,000+ database of putting lore and the Web's only newsletter on putting (also free), visit Geoff's website at http://puttingzone.com, or email him directly at geoff@puttingzone.com.